In a 3- or 4-quart slow cooker, place chicken, cream cheese, cheddar, chicken broth and taco seasoning mix. Cover and cook on high for 3-4 hours or on low for 6-7 hours. Open lid, shred chicken with a fork, stir until well mixed in cheese sauce. 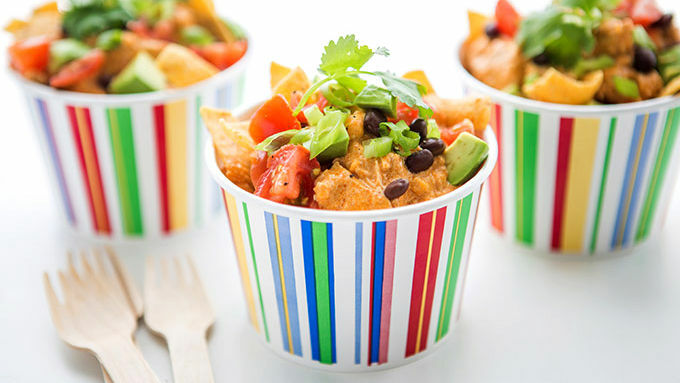 Spoon chicken mixture on top of corn chips. Top with avocado, black beans, tomato, cilantro and scallion. Enjoy! 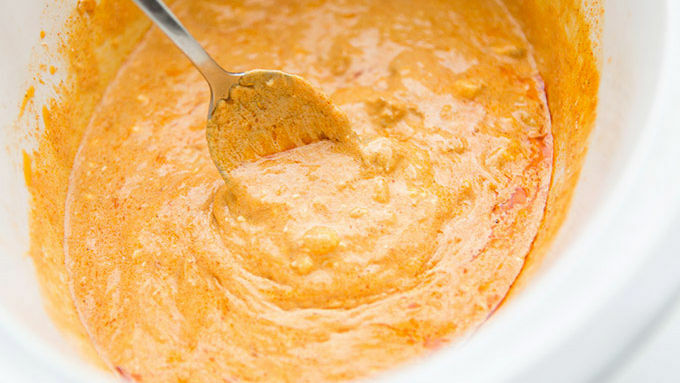 Instead of chicken broth and taco seasoning, pour two cans of Old El Paso™ enchilada sauce into the slow cooker. It’s like customizable enchiladas for a crowd. Quick, simple and so good. Fire up that slow cooker and prep a party-perfect dish. 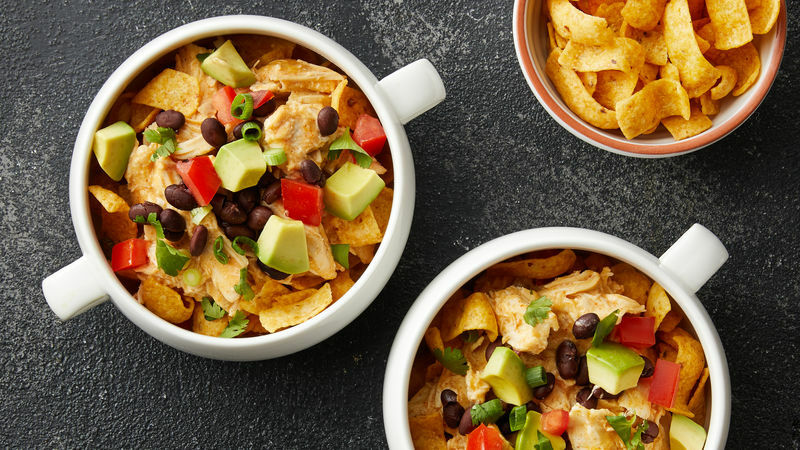 With this easy little recipe, you’ll create a crock full of creamy chicken enchilada sauce, which is served over corn chips and topped with all your favorite fixin’s. Round up your chicken breasts, cream cheese, chicken broth, cheddar and Old El Paso™ taco seasoning. (Alternately, you can nix the broth and taco seasoning and just toss in 2 cans of enchilada sauce. Whatever you’ve got in the pantry works!) Place it all in your slow cooker and cook for 4-5 hours on low or 6-7 hours on high. Just before serving, use a fork to shred the chicken and stir it into the slow-cooker sauce. Spoon this mixture over corn chips and top with avocado, diced tomato, black beans, cilantro and scallions. We used disposable bowls, but you can also hit a party store and layer the mixture in a paper dish—you know the ones they serve hot dogs in? Yum. Is this not the most fantastic meal idea? Can’t you just see all your favorite friends devouring it at your next shindig?